You can always use another hand towel and a decorated one is a welcomed gift. 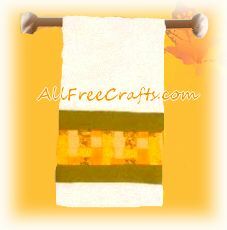 This hand towel is decorated by weaving cloth strips in autumn colors. It is inexpensive to make and works up quickly with very little sewing. Experiment with other color combinations – Red and Green for Christmas; shades of Red for Valentine’s Day; bright green for Saint Patrick’s Day, etc. I chose 4 autumn colors for the woven strips and moss green cloth for the border. 1) Press under long sides of autumn colored strips of cloth 1/4″. The strips for weaving will now be 1/2″ wide. 2) Place protective cloth on ironing surface and place interfacing, fusible side up, on protective cloth. Position the 18″ x 1/2″ strips right sides up on top of the interfacing. Using pins to hold them in place, weave in the shorter strips. ( Since I had chosen 4 different prints, I wove 1 strip of each print, then repeated the sequence). You may have some of the shorter strips left over. 4) Sew the green border pieces to the woven piece using 1/4″ seam allowance. Press seams open. Press under long outside edges 1/4″. Place piece onto towel about 2″ from end. Fold under and press ends to match width of towel. 5) Pin in place. Sew onto towel using a blind hem stitch.